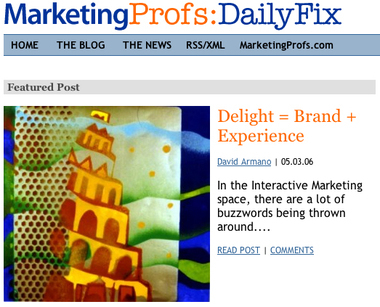 I was recently invited to contribute to Marketing Profs Daily Fix blog—and my first piece was positioned as the feature (Delight = Brand + Experience). I'm looking forward to writing about similar topics to the ones covered on this blog. These plugs are getting shameless aren't they? I promise to track down some good links to atone for my sins.